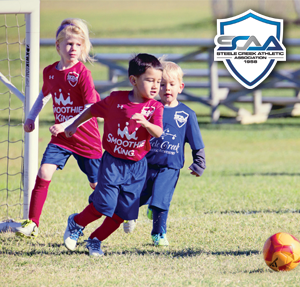 SCAA Recreational Soccer is the BEST value for soccer in the area-Charlotte, Steele Creek, Fort Mill, Lake Wylie, Tega Cay, etc.! The emphasis of our program is the training and development of each player to reach their maximum potential as soccer players and to inspire them to love the beautiful game. SCAA is a volunteer driven organization. All commissioners and coaches volunteer their time to create the best possible experience for our players and families. New volunteers are always welcome! Soccer evaluations will be held on March 10th, 1:00p.m. for 7U ONLY, birth years of 2012 and 2013. Location for evaluations are the soccer fields in the back of the complex. Rec Soccer Commission members are listed on the Soccer Contact Info page. Please contact with any questions regarding Spring 2019 registration. 2014 & 2015 (Little Kickers) - our introduction to soccer, meets once a week at SCAA for practice & play. 2012 & 2013 (7U) - coed soccer for the beginning player, one practice per week with games on Saturdays at SCAA. 2010 & 2011 (9U) - coed soccer with practice at SCAA and weekly games against neighboring recreational leagues. 2008 & 2009 (11U) - practice at SCAA with weekly games against neighboring recreational leagues. 2005, 2006 & 2007 (13U) - practice at SCAA with weekly games against regional recreational leagues. For future seasons, please refer to the US Soccer Birth Year and Season Matrix. Players may be permitted to play up or down one level with approval from the Soccer Commissioner based on their skill, size and objectives. Note: Fees are paid at time of registration. The registration and membership fees, along with donations and sponsorships, fund the programs at SCAA and pay for facility maintenance. SCAA receives no public, city, county, state or federal funding. The yearly Family Membership Fee is $80. Each family that has a child in SCAA sports is responsible for the yearly family membership fee. Sports Fees vary by sport, and each child who participates is responsible for that sport’s fee. Teams practice at SCAA. Home games are played at SCAA. Uniforms are included at all age levels. Practice and play on full fields, designed for soccer. Learn and play the game as it was meant to be played on full size age appropriate fields. League fees, referee fees and NCYSA registration fees are included, if applicable. Team Parents: Organize team snacks and assist the coach with communications. Other opportunities include Concessions, Field Maintenance.